During the reign of Amir Temur and Temurids instrumental music was actively developed. Musical instruments were usually used for aesthetic purposes. That’s why viewing platforms were constructed in front of palace’s goals. It was the place where gathered numerous viewers. 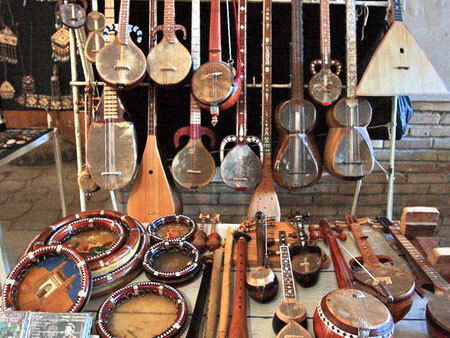 Musical instruments were used during the military campaigns, appointment of military ranks, religious and hunting activities. Amir Temur was very strict for musicians, checking their professionalism and personally appointing musicians and heads of music groups. At that moment experienced and famous musicians were coming from different countries to Samarkand. Most of them were invited for the exchange of experience. In such condition musical art had been developed at high level. Folk festivals and holidays had been celebrated widely and attracted many locals. The most famous and frequently used musical instruments were percussive and wind instruments. They used in the military campaigns. It’s copper “koranai” (karnai), “naiy rumi”, “bug”, “nodir” and others. The main instrument was “chabchig” - it directed the movement and was an original herald. 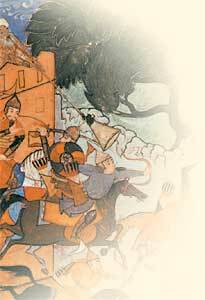 Lusien Kere, french historian wrote that Amir Temur arranged special celebrations, which inspired the warriors. These celebrations were held as the troops parades and could lasts more than 2 days. Hunting was also carried out with the use of percussion and wind instruments. The information about musical instruments of Temirids epoch we found out from the book “Tuzuklar” that was written by Sakhibkiran. He described every instrument in detail and also pointed to task they performed.